Tekin & Spektrum AVC Calibration Tips – Tekin – Smaller, Smarter, Faster! 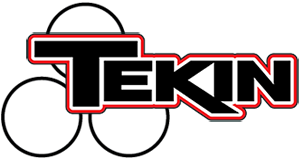 Are you having an issue calibrating your Tekin ESC to a Spektrum radio system with AVC? We can help! Plug in the “bind” plug into the “bind” port in the receiver. Power up the model. The amber colored LED in the receiver should be flashing or flickering. Power up the transmitter first and put it into “bind” mode. The receiver will flash a few times, turn off, and then come back on solid. Full throttle, the LED on the receiver will go out, release the throttle. LED back on. Full right steering (Must be right first), LED will go out, release right steering. LED back on. Full left steering, LED will make 2 quick blinks verifying successful calibration. If successful you will get a final confirmation chime and “reboot/arm” chime sequence. You’re done! The AVC receivers do not differentiate between throttle and brake during its calibration process. For Example: If you input two throws of throttle then steer right and left to test the function of your radio you will encounter no brake/reverse. If you input two brake/reverse throws in the same fashion you will encounter no throttle and all reverse. It is possible that after the bind process the receiver had recognized two throttle inputs and some steering. No Throttle but has reverse? It is also possible that after the bind process the receiver had recognized two brake/reverse inputs and some steering. The AVC receivers will take two inputs from the trigger then left and right steering. If these actions are not performed properly then the symptoms above will surface. Want to Disable the AVC on your Spektrum system? Simple, in your AVC active radio system it comes with two bind plugs. Why two? You insert one bind plug into the BIND port of your receiver then insert the second bind plug into the DISABLE port on your receiver. Binding your radio in this process will disable AVC altogether. To indicate the AVC function has been disabled the amber light will continuously flash. The same calibration process is still needed so don’t forget to PULL FULL THROTTLE, PUSH FULL BRAKE then STEER RIGHT then LEFT then your done and ready to get out and tear up the track!